The Coddington estate was purchased by Sir William Cavendish and his wife Bess of Hardwick in 1580 and comprised some 90 acres of meadow and arable land. This was centred on what is now known as Coddington Farm, the present road being the boundary of the property. Records of the farm are held in the archives of Chatsworth House but are somewhat patchy. Rentals show that from at least 1700 the farm was tenanted by Thomas Lowe and there was still a Thomas Lowe there in 1774. However on Lady Day (March 25th) 1791 the tenancy was taken over by Thomas Towndrow and held by him until Lady Day 1838 when it transferred to David Towndrow. The lease was then taken by the Sims family until 1916. Sims had been operating a quarry on the estate since the beginning of the 19th century and as their enterprise grew they took over the farm as well. The quarries became more extensive and later became known as Dukes Quarries. Following the Sims' departure Charles Lister took on the farm between 1916 and 1923 when it was leased from Lady Day 1923 to George Ludlum Gregory. There are virtually no references to the actual building in the Chatsworth archives although surviving documents suggest that there was a house on the site by 1700 (this does not necessarily mean the present house). It is not unusual for there to be no direct references to a property on Cavendish lands unless work was carried out there by the estate. In the case of Coddington Farm, an estate account of 1853 refers to "£460 spent on new farm buildings" but gives no details. The farm's name was Coddington Farm and the change to Coddington Hall Farm, as used by some people, was an affectation probably added in the nineteenth century. The farm was bought from the Duke of Devonshire on 14th December 1956 by the Gregory family. John Gregory sold it to Arnold Hawksley on April 21st 1972 and in 2008 it was sold to Ken Briddon by Hawksley's heirs. 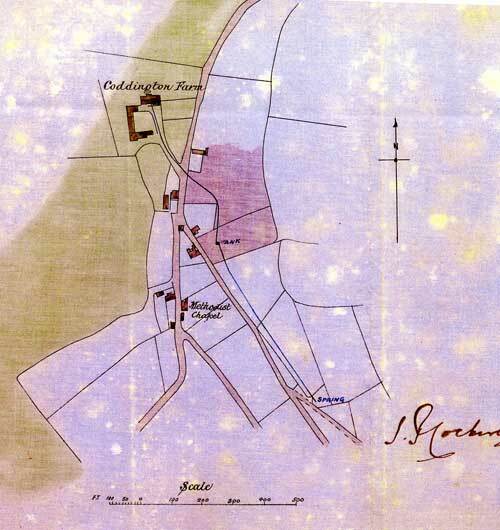 An agreement, with map, made 9th April 1885, between Walter Yates of Coddington and William, Duke of Devonshire to allow water from a spring on land owned by the Duke to be taken along a pipe to a tank built on Walter's land; a further pipe will convey the water to Coddington Farm which is owned by the Duke. The Duke will pay Walter one shilling per year every Lady Day for as long as the Duke and his heirs continue to use the water. The agreement is signed by Walter and the Duke, with two witnesses, one in Cromford and one in London. Agreement, with map, signed by the Duke's agent John Pepys Cockerell on behalf of the Duke, by which the annual rent increased to ten shillings per year and the Duke is allowed to have his staff maintain the tank and pipes. Following correspondence from the Duke's agent Potters wrote to Fred Yates (farmer) at the end of 1946/early Jan 1947 to terminate this agreement with effect from 25th March 1948.